Review from James, Sept 2017: A fabulous apartment right in the centre of Morzine. Near the bars and restaurants in town and close to the lifts. Rachel, Dean and Hayley were all great and made the stay really easy for us. Review from Michaela, July 2017: Lovely stay at this well situated Chalet. Great access to all Morzine has to offer. 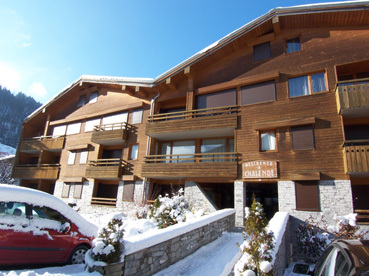 Chalende 24 is a really spacious, modern apartment for 6 people, in a high-quality Residence situated right in the centre of Morzine, 80m from the Pleney slopes, and right in the midst of all the resort's facilities, shops and restaurants. This second floor 2-storey apartment is accessible by lift, and has a balcony overlooking the Rue du Telepherique, with views up to the ski area of Nyon and across to Pleney. Excellent for self-drivers as it has its own underground garage. Entrance is directly into the living space, which is bright and airy, with full-length windows along the South-East facing side. The lounge has a curved sofa and armchairs, coffee table and TV with Freeview TV / DVD. There is a decorative fireplace. The dining table seats 6, and there is a partly-open kitchen in the middle, which is fully equipped with fridge, cafetiere, microwave, electric hob, electric oven, dishwasher and clothes washer / dryer. Off the dining space is a WC. Up the stairs is the large galleried mezzanine, overlooking the lounge, with Velux window. Overlooking the rear is a double bedroom, and overlooking the front is a twin bedroom, both with built-in cupboards. On the mezzanine between the bedrooms there are two single beds, or a double sofabed if preferred. (Maximum 2 people can sleep on the mezzanine). There are 2 bathrooms (one has a shower and WC, the other has bath). There is a garage space for parking 1 car (max headroom 1m80), and a Cave at level -2 (accessible by lift) for ski and boot storage. The apartment is 90 sq.m, and has electric central heating, and limitless hot water.